Oliver the Sensational Snowshoe-Siamese mix! Thread: Oliver the Sensational Snowshoe-Siamese mix! Dearest Oliver, what a beautiful kitty you are! You are so handsome with that soft-looking multi-color Snowshoe-Siamese-mix fur, and what a sweet face you have with that cute pink nose and those lovely big blue eyes. Thank you for sharing those great pictures with us! They show so well how gorgeous and distinguished-looking you are. I wish I could reach through the screen and over to Hayward, CA to pet you, and pet your kitty housemates, too! I can't, of course, but I know your loving and beloved Purrrson will pet you all for me . And what a delightful Purrrsonality you have! As your dear Purrrsons says, you are "..a smart, handsome and personable cat always ready to play or help with the household chores." He/she adopted you from a shelter three years ago, and what a tremendous example you are of the wonderful beings to be found at shelters! It took a while for you to adjust to your new home, but with time you learned to trust again. Now you rule the house and boss the other cats around! You're very independent but a great snuggler at night. You like to sleep on your dear Purrrson's arm and will nip it to remind her/him if it's not stretched out waiting for you. Then you purr and purr until you both fall asleep. You even love your carrier and will get right in for trips to the vet's! You and your dear Purrrson love each other very much, don't you. He/she says you are "..a purrfect kitty boy!" What a wonderful love-filled home you share! Congratulations, darling Oliver, on being chosen today's Cat of the Day! We hope you and your dear Purrrson and kitty housemates and all your family and friends are enjoying a fine celebration, full of fun and lovies and all your favorite games and treats. There's no question that Oliver is exquisite and very special. It is lovely that he sings you to sleep with his purrs and goes in his carrier without any fuss! That is almost unheard of, impressive cat Oliver is! His coat and eyes are beautiful, I hope his day is extra special!! Oliver is very independent during the day but a great snuggler at night. If I don't stretch my arm out in bed for him to lay on he will gently put his teeth on my arm to remind me. Then he purrs and purrs til we are both asleep. He loves for me to go back to bed after breakfast and will happily sleep all morning with me. He even loves his carrier and will get in when I ask him to for trips to the vet! When you adopt an adult cat from a shelter you always wonder where they came from and what they have been through but you will never really know. I think Oliver deserves to be Cat of the Day because he has learned to trust again and is a purrfect kitty boy! Hello, Oliver in California! Happy Cat of the Day! What a handsome Snowshoe Siamese kitty you are! I like your soft fur, your long whiskers- and your beautiful blue eyes! You are always ready to play or to help with household chores! You are in charge, bossing the other kitties around with your velvety paw! You end the day by snuggling with your person, purring and purring, and even making sure your person's arm is in exactly the right spot. As your person said, you are a purrfect kitty boy! Happy, happy Cat of the Day to purr-ecious Oliver! Dear Oliver, what a most handsome Snowshoe-Siamese mix you are. Your plush coat looks so soft, and your face with those light blue eyes and those long whiskers is so beautiful. I think that your photos are great, and that you secretly enjoy being a model! I am so glad that your person decided to adopt you from the shelter. Even though it took you many months to trust humans again, you finally figured out that this was your forever home, and that you will never have to worry again about being discarded. You are a busy boy, helping with household chores and bossing the other kitties around. Independent during the day, at night you become a snuggle bunny, and you purr yourself and your person to sleep. Oliver, you are beautiful inside and out, and I wish you, your kitty siblings and your family a great day full of celebration, and many more happy and healthy years together. Hi Oliver! Happy Cat of the Day! What a breathtakingly beautiful Snowshoe x Meezer boy you are, Oliver! Endless thanks for patiently posing for the camera, so that all the world could see just how beautiful you are! Oh, how a girl could get lost in those incredible, sparkling blue eyes of yours! You're a stunner! I can't begin to imagine how a boy as beautiful, as sweet and loving as you, came to find himself homeless, languishing in a shelter, paws crossed in hopes of finding that committed furever home you so rightly deserved! Thankfully, your wish was answered, and the rest is happy history! Yes, it took a bit of time before you would adjust to your humans, your new surroundings, to learn to love and trust. But before long you realized that you were just where, and with whom. you were destined to be, ultimately assuming your rightful role as King of the Household! How well your humans' unconditional love and patience has been rewarded! Purrfect, that you are, Oliver, purrfect in every way, and so very deserving of your Cat of the Day crown! You're the poster boy for adult kitty adoption! How lucky your human is, having a handsome, sweet and personable, loyal and loving best furry family member in you, Oliver! You're the "cat's meow!" Great thanks to your human for sharing your heartwarming rags to riches rescue story with us, Oliver! Meeting you this evening, having the pleasure of honoring you here tonight, has been a joy! I hope you're enjoying your big day in the spotlight, being loved and pampered to pieces, treated to all your heart desires and more! Lots of love, cuddles and kisses to you, precious Oliver, our very special and most deserving Cat of the Day, EVERY day! Love to all of your furry siblings, too! Congratulations on being honoured as Cat of the Day, Oliver! What a handsome guy you are, Oliver. 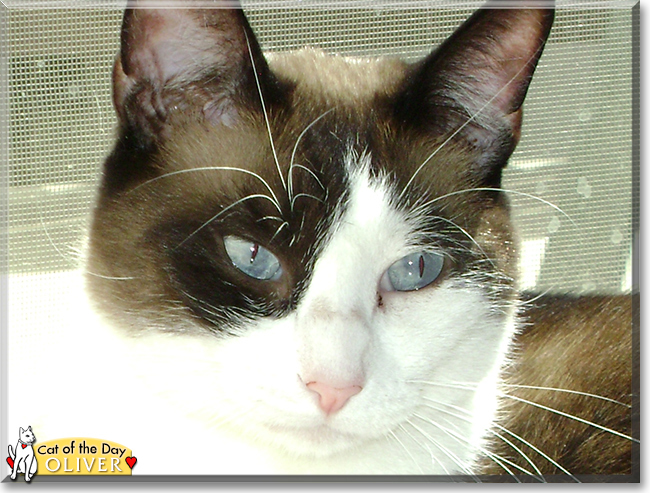 Your Snowshoe Siamese coat is beautiful and so are your blue eyes, and look at that cute pink nose! Although it took you a while to adjust to your new home, you learned to trust your new family, and are now ruling the house! You sound like such a sweetheart, snuggling up with your people at night and purring until you both fall asleep. You also help with household chores and you have other cats to play with… and rule over. Enjoy a day of fun and celebration with your family, and get pampered with extra treats, tummy rubs and lots of snuggles. I wish you a long, happy and healthy life, sweetheart!